Your essential Canon EOS 5D Mark III camera field guide in a convenient pocketable style. 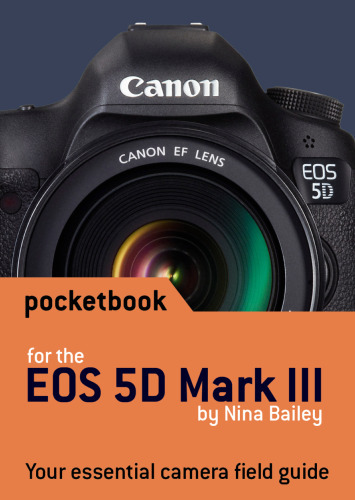 This EOS Pocketbook for the 5D Mark III is a concise guide to your camera and small enough to carry with you everywhere. Nina Bailey, Technical Editor of EOS magazine and author of the popular EOS eBook series, has the solution. This new Pocketbook for the Canon EOS 5D Mark III is a concise guide to the most used and confused features and controls on your camera, based on Nina’s vast experience as lecturer at EOS Training Academy – hearing first-hand what photographers want to know and understand about how their EOS 5D Mark III camera operates. Gives basic, background information about using the 5DIII for photography in very scant detail. No additional hints and tips which are not in the instruction manual. There is absolutely no information about using the camera's video recording facilities. Extremely disappointed all round with this booklet which is, for me, a total waste of money. We're sorry to hear that you're disappointed with the Pocketbook. It's designed to be an aide-memoire – picking out the key camera features for when you need a reminder out in the field, rather than a guide to getting more from your camera, as many people don't remember what all the key controls do. We've sent you an email with regards to returning the item. Perfect ! - Ideal for keeping in the camera bag as a handy reference. A good idea for these complicated optical computers. Does what it's supposed to do. Good aide memoire.